Did you know that the coldest day on record in Virginia was -30 (yes, that’s “minus” 30) in January 1985?! Yikes! I know, that is a very extreme and very rare occurrence, but, none-the-less, it can get really cold in this state! Just look at the weather we had at the beginning of this January! Brrr…. Did you know also that your dog can be very vulnerable to the dangers of cold weather? Just because he wears a fur coat doesn’t mean he’s protected from the elements. Unfortunately, there is no clear-cut answer on how bad the weather has to be before we take extra precautions to keep our dog warm. If we could only state emphatically that all dogs should not be let out in the cold if the temperature falls below X degrees and be done with it, that would be perfect. But it’s not that simple. Cold weather affects each dog differently, based on many factors: age, health, coat density and breed, to some extent. An elderly dog has a harder time regulating his body temperature. Even your thick coated Chow Chow could feel the effects of cold weather more so as a senior dog. The only way to know for sure if your elderly dog is sensitive to the cold is to watch for signs… Shivering, shaking, or just a reluctance to being outside. Additionally, elderly dogs often develop arthritis and joint pain. The cold weather makes his joints hurt even more. It may be helpful to provide your sweet old dog with a sweater or jacket… maybe even booties, and limit his time outside to potty walks. Make sure he has a nice, warm bed to retreat to when he comes back inside, maybe even placing a hot water bottle under his blankets. Puppies have less muscle and less fat than adult dogs do. Muscle helps increase their metabolism, which aids in keeping them warm, and fat provides insulation. Until their body is fully developed, they’ll have a hard time generating body heat. Also, their still growing coat is not yet sufficient to keep them warm, even if they are a cold weather breed. Lastly, their little paws have not yet toughened-up enough to thoroughly protect from the hazards of ice and cold. It’s best to limit a puppy’s time outside to short potty breaks, and even then, a coat or sweater and booties is recommended. Aside from being a senior dog or a puppy, there are some diseases that can hinder a dog’s ability to regulate their body temperatures too. Some of these more common to our canine friends are heart disease, diabetes, hypothyroidism and Cushing’s Disease. If your dog has any type of health issue, check with your vet before letting him spend an extended period of time outdoors when it’s cold. We also discussed how arthritis can be aggravated by cold weather. So can hip dysplasia, intervertebral disc disease, prior fractures, and any other joint issue. Limit your dog’s time outdoors to short potty breaks and then warm them up quickly when they come back inside. Be sure to dry them off if they have become damp. There are some dog breeds that naturally have dense undercoats and thick outer coats to keep them warm in the winter: Akitas, Siberian Huskies, Samoyeds, Newfoundlands, Chow Chows, and Keeshonds, to name a few. When properly conditioned, these dogs can withstand colder temperatures, keeping age and health in consideration. “Conditioning” is important, regardless of the breed. A dog’s coat is actually designed to grow thicker when the temperatures drop, but that’s only if he is used to being outdoors. If you have a heavy coated dog who lives his life indoors, he will not have been conditioned to spend long periods of time in the cold outdoors. Take him for walks in the morning and evening to get him “conditioned” to temperature changes. Start with shorter walks and then consistently increase the amount of time spent outside. Conversely, there are some breeds with very thin coats who are sensitive to cold weather. Some of these breeds are Chihuahuas, Greyhounds, Dachshunds, and Miniature pinschers. Others have a short coat – not necessarily a thin coat – but are also vulnerable to cold weather: Pitbulls, Boxers, Boston Terriers, Vizsla’s, and some in the hound group as an example. Your healthy adult dog will most likely love cold weather and snow. It’s invigorating to them and it’s perfectly fine to let them have fun for limited periods of time. If your dog gets too cold, he will let you know. Watch for signs: Whining, whimpering, heading to the door, or shivering. Consider shorter but more frequent exercise walks when it’s cold outside. 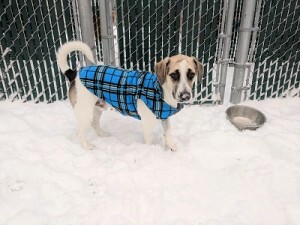 A coat or sweater goes a long way to keeping your dog’s body warm, but keep in mind: his exposed ears, tail (tips), and paws are still vulnerable for frostbite. If they turn blue or pale, you should see your vet immediately. Better yet, don’t let him stay outside so long that something as dangerous as frostbite could occur. Be sure to clean the snow and ice from his feet and between his paw pads when he comes inside. This will also help to eliminate any snow removal chemicals that he may have walked through. Use this time to check for any cuts or cracks that can happen when playing in the ice and snow. Don’t forget to have water available for him when he is outside, and make sure it doesn’t freeze. If your dog is outside often during the winter, increase his food intake. It takes a lot more energy to stay warm, so he will be burning off the calories quicker. If you regularly groom your dog, consider leaving his coat a little longer in the winter to help keep him warm. He still needs his regular trip to the groomer to keep him clean, prevent him from matting, and all the other important things a Groomer does! If your dog gets wet, his body temperature could plummet. A wet, cold coat is a blueprint for hypothermia. Speaking of which, if you are vigilant in watching your dog for signs of cold, he should never get to the point of suffering from hypothermia. However, know the signs: weakness, listlessness, shivering, and slower breathing. If you see anything that might indicate hypothermia, take your dog inside immediately, wrap him in warm blankets (Warm them up a little in the dryer), try to give him slightly warmed water to drink, and call your vet. Here’s the best idea ever: Bring your dog to Holiday Barn Pet resorts daycare when it’s cold outside. We allow our Campers brief potty breaks outside but bring them into a warm room for play. We have designated play rooms with plenty of room to run, romp and exercise! And BTW, did you know that the guest rooms at Holiday Barn Pet Resorts have heated floors? Your pet will stay warm and cozy when it’s cold outside. Our guests love them! P. S. I love this chart https://www.gopetplan.com/blogpost/cold-weather-and-dogs developed by PetPlan pet insurance. Error: Error validating access token: Session has expired on Monday, 29-Oct-18 09:08:51 PDT. The current time is Thursday, 18-Apr-19 19:29:14 PDT.